Before we go into the reviews and consumer reports of adjustable beds, we will first see what adjustable beds are. Adjustable beds or bed bases/ foundations have been designed to elevate the head or leg position of the users. The adjustable beds are used either by people with health problems, post-surgical recovery or by users to lie down comfortably in bed to watch television or read books or to rest. Users have to choose the size and design that suits their needs. Most of the queen and king sized beds can be adjusted on both sides separately. The underneath of the adjustable beds should be firm and flexible. The plywood deck should have a minimum thickness of 5/8” or 3/4” thick to make them durable and to prevent warping of flexing. The attached parts should also be securely fixed and should not come out over time since most of the wiring harnesses and massage motors are set underneath. Size is one of the first features to look for while buying adjustable beds. The sizes available are twin size for single users, and queen and king size for couples and those recovering after surgery (for post-surgical users, king size is preferred). The mattress used on surfaces can vary from memory foam, coil or air beds all of which have models to suit adjustable beds. The motors used for adjusting the beds are essential, and they should be durable. Both AC or DC motors are in use, although DC motors are less expensive, Motors should be UL listed and rated. Noise is another feature to look for in mattresses. The lesser the sound, the better. Hand controls are available to adjust the bed positions, and users should look for clear and easy menu options. The remote could be wireless for aesthetics, or wired remotes are also available for users who are forgetful and keep searching for things. Users should also check the warranty terms when buying adjustable beds. Warranty terms can include additional costs involved for damage to beds or other broken parts. With a little extra cost, the warranty can be extended to cover all these factors. Customers looking for aesthetics can check for the fabric of the mattresses used, the placement of the motor (whether the mounting of the motors are visible or not) and whether the finish of the bed is appealing and functional. 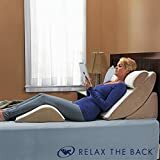 Some of the high-end features that are useful include some app features and programmable memory positions that make it easy to remember the preferred positions for adjustable beds. Another very convenient feature is the presence of USB charger ports on either side of the bed. Backlit remotes help to adjust sleep positions at night. Most adjustable beds should be able to support weight between 250 to 600 pounds including the weight of the mattress and the users. The most important part of adjustable beds is the sturdy chassis or superstructure as this is the core of the adjustable bed. Most customers who reviewed adjustable beds looked for the comfort, convenience, and easy maintenance. Warranties too played a big part in judging the adjustable beds as there were mechanical and electrical parts involved. Reviews from the various sites showed an overall satisfaction rate of 93% for adjustable bed bases/foundations. Most of the popular brands’ reviews had more or less the same satisfaction level since the ratings tend to vary for different features in each of the brands. It was found to be a misconception that higher priced models had better consumer satisfaction. The prices of adjustable mattresses are in the range of $700 to $5,000, and the expensive models have more features incorporated. Customers with medical problems would get better deals on their adjustable beds if they had a physician’s prescription. Most of the adjustable beds had a breakdown rate of 15- 20% and made these beds unusable until repaired. Hence the warranty factor is crucial. More than 25% of the customers reviewed reported having benefited after using adjustable beds. Their reviews were better circulation, reduced problems from insomnia, arthritis, breathing problems, cramps, asthma, and various other health benefits. Customers also reported 25% or more satisfaction for the convenience level of the adjustable beds. Couples were especially happy with the split designed queen-sized and king-sized beds as it allowed different adjustments for each of the partners. Customers also reported a higher level of noise in adjustable beds with AC motors. Those with DC motors were comparatively quieter. Even mattresses with massage functions had a higher noise level. 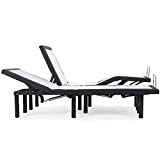 Most customers reported that the adjustable beds required little or no assembly and also very little maintenance. Customer dissatisfaction was higher for the warranty issues also as the warranty conditions were different for different models and customers were not completely aware of all the terms and conditions. Return policies are expensive for adjustable beds, and the costs could include transportation or restocking fees which could work out to be higher. Customers need to look for mattresses which are compatible with adjustable beds. 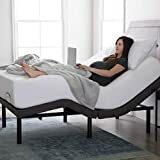 Most of the popular mattresses like the memory foam, latex, innerspring mattresses with pockets, and air mattresses were found to be compatible with adjustable beds. Traditional Innerspring mattresses do not work that well with adjustable beds. Air mattresses are mostly consistent with adjustable beds. Customers preferred mattresses with a thickness of 12” or less as thicker mattresses were less flexible. Memory foam mattresses worked better on adjustable beds. Companies like Saatva have introduced the Loom & Leaf memory foam mattress which is more compatible with adjustable bed frames. Their traditional mattresses do not work with adjustable beds. One major factor for dissatisfaction is the weight of the mattress which makes them difficult to move and handle. Higher priced mattresses were costlier than the cheaper models. 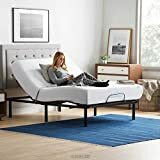 Based on various consumer reports and ratings for adjustable beds, many leading brands were found to good satisfaction levels, though the scores for the different features varied. Here we will be looking at some of the popular brands that had good satisfaction levels. The leading brand was found to be Leggett & Platt with over 40 years of experience in adjustable beds. 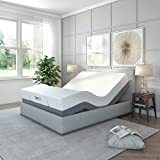 Ergo-Motion, iComfort, and Temper-Pedic, EasyRest, Serta Motion, Sealy Reflexion, Amerisleep, Costco, Sleep Comfort, and Personal Comfort are the other well-known brands. Customers will get greater satisfaction when they know what features to look for before investing in adjustable beds so as not to be quickly taken in by the sales person’s glib talk.